Traveling Sardine Class: Delayed . . .
Me. Not Granddaughter. 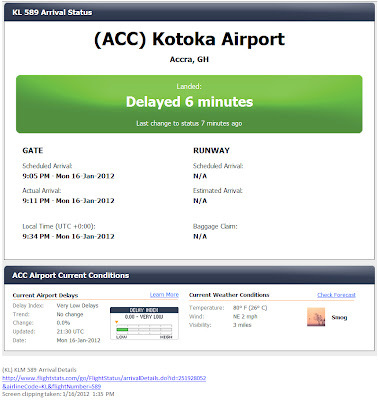 Oh, the plane arrived, 6 minutes late, in Accra, Ghana, 9:11 p.m. their time on Monday, 1:11 p.m. our time. Provided she was on the plane. That hardly counts. But I had things to do before I posted that. My kittens in irresistible cuddly poses. You can't put anything over on Jean-Luc. He usually catches me out with a camera. ﻿This was the day before January 17, a day relevant for those of us who "get" to pay estimated taxes. I wasn't taking any chances about missing the deadline, so I took the skinny, valuable envelopes into the closed post office on Monday. It was another bright sunny day, but noticeably colder than it has been. At 4:35 in the afternoon the outside temperature was 35°. I wore vest and jacket, then wrapped a scarf around my head. Then I continued work on the Soroptimist newsletter, until ... a cat, I think the Henley cat, flashed along the table beside my computer, blasting toward me at about 100 mph, hurling my glass of ice water across the keyboard, the mouse, my handwritten Soroptimist draft, my lap, my chair, my UPS (uninterruptable power supply), the carpet. ICE water. You don't want me to repeat what I said next. Towels. Removal of batteries. Shaking of keyboard and mouse. Hair dryer. Fortunate discovery of how to shut down the computer using the touchscreen. An overnight rest. A message box announced that the mouse was installed and operative, except that the cursor wasn't moving. Some fiddling with batteries followed and once the invisible "+" indicating battery direction was deciphered, the old mouse worked. By then it was time to go to a midday Soroptimist meeting. Afterward I tried my normal mouse again and it still didn't play nice. As a last ditch effort, I thought I'd turn its battery around. The battery fell out when I opened the mouse, but I reinserted it after verifying the invisible "+" and it worked. If the battery was in wrong before, why did it work at all? That is why my confirmation that Granddaughter arrived in Accra okay was delayed. She left a phone message for her mom today. She has uploaded her photos to Facebook, although none of them was taken after she left LAX. We know she's really there. Will granddaughter be sending pictures to you to share with us? I'm sorry about your mouse! I recently destroyed my computer keyboard and mouse by spilling coffee. So annoying. Still on Lost Luggage... what's up?